I have worked with many women, one-to-one or in a group, who want to go back to work with confidence, after maternity leave, a career break or redundancy. Here are the 7 simple steps that take mums through to get back into the workplace and on that career ladder. 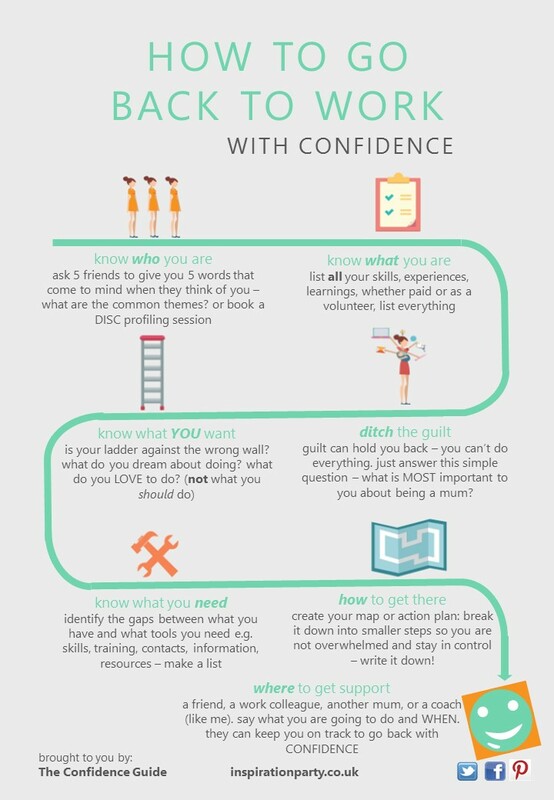 To go back to work with confidence, just follow these 7 simple steps in order. To speed up the process and achieve your goal more quickly, then yes, working with a coach will be a valuable investment. Of course, I’m bound to say that, being a coach myself. But you’re a smart woman and you know that support and accountability will help you get results more quickly. However you might be feeling overwhelmed or undecided or just don’t know where to start …. if you think you could do with some help (even if you’re not sure what the help might look like), let’s talk. Book a time today and let’s explore what help you need and whether I’m the right person to help.